Mia is 21, from Finland, 5ft 10′, and now with IMG (all four capitals). Speaking of IMG, little Jac, who’s been sweeping New York and Milan shows, is probably banned from Paris for her age but no one knows until the Miu Miu show. She’s a bit on the bigger side. I think she should lose fifteen pounds. I don’t think she’ll make it big. When I saw her picture, yes, she’s nice, but I did not get that flooring feeling that Catherine McNeil and Natasha Poly gave me the first time I saw their Polaroids. From some comments I saw, she has a pretty bad posture on the runway, which doesn’t help her figure… but Eniko Mihalik/Lara Stone and a lot other curvier models scored more eds because of that actually. In any case, she is probably going to get skinnier and skinnier before your eyes as the season goes. She looks better. 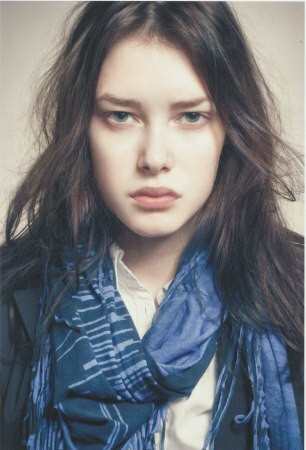 I prefer a model like her than those model who looks like they are sick. I must say she can bring the dress ok but she lack of posture and elegance like any other models i know. I think she need to practice more. the zeros are almost over and i’d hope sincerely that this will be the end of the sickening size zero trend too. just yesterday i viewed some 90’s shows on youtube. what a great view all these personalities with their own walk and style. not that skinny and so often unregoniseable walking sticks. mia has the right age too. i hope we see more of her and models like that.